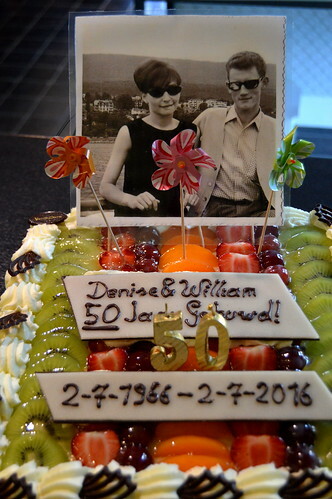 Fifty years of marriage… so many things that happened during those years… in the world and in their own lives… death… but also life. Tears… but also peels of laughter. Utter distress… but also utter bliss and happiness. Many things they would do the same… and perhaps even more they would do otherwise. So here we are… fifty years later… three children and nine grand-children later… celebrating the past fifty years… and celebrating many more years to come. Mum and dad… I love you heaps. 50 jaar getrouwd; dat hoor je niet zo vaak. Proficiat voor je ouders! Bedankt! We hadden echt een heel mooi feest… met haar 2 broers en schoonzussen en alle kinderen en kleinkinderen. Mooie herinneringen alweer! 50 years, that’s huge! Congratulations to the happy couple!